Today I am here with Robbie Gautreaux, he is a brown belt under Rafael who is a Brazilian guy that owns a school here in Louisiana. Robbie has a school here in Baton Rouge, Louisiana. I’m here today at his school and Robbie is going to show us one of his favorite techniques. He is going to show us a pretty basic choke from side control but Robbie has a sequence to do this choke that I really like. I knew this position before, but the way that he does it and the sequence that he uses is something I’ve never seen before. This is one of the things that I love about Jiu Jitsu. Sometimes you know the same techniques but everyone has a different sequence to do the techniques. 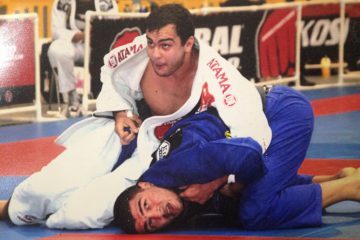 It is one of the best parts of bjj. 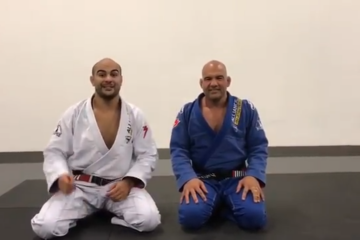 Let’s see below how Robbie does the choke and then I will break down the technique. So first Robbie shows a basic entry to the paper cutter choke where he uses his hip to bend your arm so that you let go of your frame and then he can attack the choke. This variation is very simple and in the Alliance curriculum we learn this choke as a white belt. The variation he showed next was something I had never seen before. Once I know he is trying to break my frame, I become smarter and hold my frame stronger. This is where Robbie uses a great sequence. He brings his arm next to my ribs and below my armpit, than he does a big back step to other side and I cannot follow his back step. Now he ends up on the other side in the exact same position. This is really tricky because most people are preoccupied defending the first variation, the basic one, which they open up and when Robbie does this big back step they will not see it coming. I really like this position because it is an advanced sequence to a basic move. This choke is really simple and effective and like I said before, in the Alliance curriculum, we learn it as a white belt. Guys try out this position and see if it works for you. Robbie is so good at this position and has been doing it for a long time. Also, don’t forget to download my free E-Book! I think you guys can learn a lot from this E-Book. It will really help you guys.